Are you the owner of Alaskan Angler RV Resort? Did you know that you can convert this page to a complete listing of your services today for nearly nothing? Put your listing in front of visitors planning their trip to Alaska. Add your own coupons, pictures, services and more. Full advertiser packages available. Contact us today, we're your neighbors and friends so don't be shy. 15620 Kingsley Rd, Ninilchik AK. Alaskan Angler RV Resort offers a limited number of hook-ups for RV's at their seaside location in Ninilchik Alaska. Alaskan Angler RV Resort is a Good Sam Park that is located on 8 acres close to all the fishing and services in Ninilchik. Free Wi-Fi at your site is now part of our long list of amenities: new showers and laundry, widened sites, the area's only satellite TV and 50, 30, 20 amp service. You will appreciate our large standard sites, and love the option of our super sized sites. All are big-rig friendly. We also have 10 partial hookup sites and a secluded tent camping area. Bring together some good ole Alaskan fishing with a relaxing stay at the Alaskan Angler RV Resort in Ninilchik AK. Fully guided salmon and halibut fishing is the specialty of AFishHunt Charters in the prime location on the lower Kenai Peninsula and amidst the major fishing waters of Cook Inlet. Alaskan's love their fishing and the Kenai Peninsula has long been the destination of choice as their is just no better fishing available within driving distance of the main metro areas of Alaska. Description - Good Sam Park within walking distance of Ninilchik River fishing holes. Close to beach and good razor clam digging. 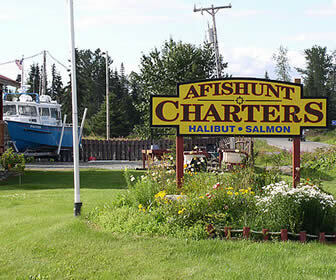 With some of Alaska's Best Halibut Fishing just moments from the doors, Alaskan Angler RV Resort and Afishunt Charters combine for the "All-Inclusive Fishing Trips" award in Ninilchik AK. Alaska salmon and halibut fishing charters with RV parking on the premises making All Inclusive Alaska Fishing Charters for salmon and halibut affordable to you.